(March 8, 2018 – Toronto, ON)) One of the things about award shows is the friendly competition to see which production grabs the most trophies. That was the big thing about The Shape of Water. Imagine… 13 nominations and 4 Academy Awards. More than anyone else. That’s bragging rights and last night the CTV detective mini-series Cardinal took more than any other production with five trophies on the second of several nights of the Canadian Screen Awards. Cardinal’s haul included awards for best achievement in casting and best supporting actress for Allie MacDonald (pictured below). Photo of Allie MacDonald at the 2018 Canadian Screen Awards © 2018 RA.Lucas. Photo of Sarah Polley © 2018 by R.A.Lucas. gathered crowd to settle down and stop talking. His show was nominated for a number of awards winning in the category of best supporting or guest actor, for Phung. CBC’s Baroness von Sketch Show and Alias Grace tied with four awards each. The Sketch Show took trophies including best sketch comedy program or series and best writing in its genre. 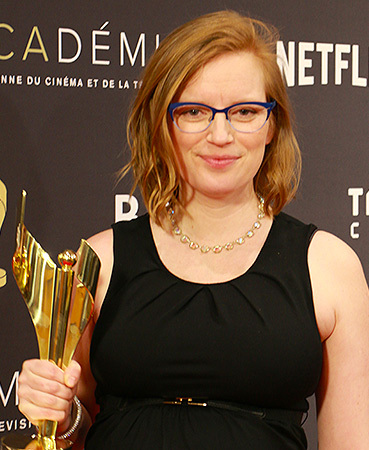 The mini-series Alias Grace, based on Margaret Atwood’s novel, took awards for Sarah Polley who wrote the script and Mary Harron, who wasn’t at last night’s festivities, won for directing. The TVOKids animated children’s series PAW Patrol was called to the stage three times for Best Preschool Program or Series. Orphan Black, now out of production but in syndication, won two trophies for its final season, including best writing in a drama series. 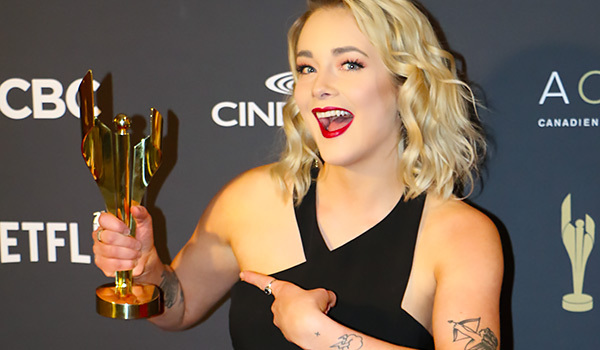 CraveTV’s odd throwback comedy Letterkenny won best writing and best direction in a comedy and CBC’s Schitt’s Creek also got two nods, including best supporting actress for Emily Hampshire. Global TV’s Mary Kills People won Best direction in a drama series and a best guest actor award for Steven McCarthy. Cloudy with a Chance of Meatballs also took two Canadian Screen Awards, including the top of category Best Animated Program or Series. History’s Vikings, TVOKids’ Odd Squad, and YTV’s L.M. Montgomery’s Anne of Green Gables: Fire & Dew, brought the series star Ella Ballentine her first Canadian Screen Award. Things can get a little complicated for viewers when there’s more than one series with similar content. CBC also has their take on Canada’s most famous young women. 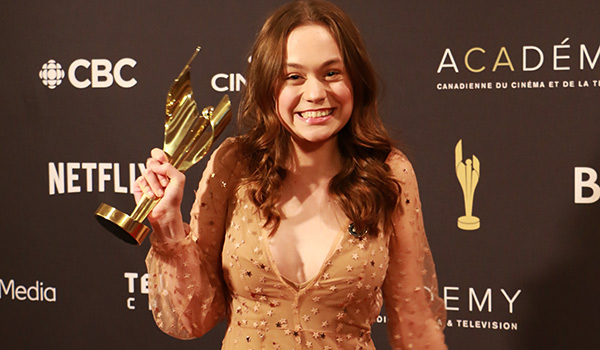 A CBC-Netflix coproduction, Anne went into the night with a remarkable 13 nominations but by the night’s end, only R. H. Thomson won for his work on the series in the role of Matthew Cuthbert proudly unveiling his Best Supporting Actor Canadian Screen Award. 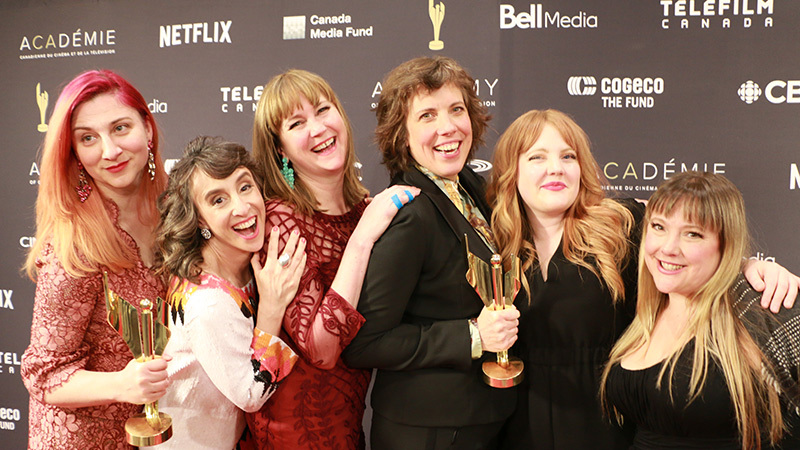 Wrapping up this look at the second night of the Canadian Screen Awards by the numbers, CBC, in partnership with its production partners, walked away with 12 awards from The Academy of Canadian Film & Television. The final awards show will be broadcast from the Sony Centre of Performing Arts on CBC at 8 p.m., 9 p.m. AT and 9:30 p.m. NT. Also see: Canadian Screen Awards – Take One.